Written by Brian Ratti on June 25th, 2015 March 15th, 2017 . There are some people that like colorful pens, bright reds, blues, yellows and the metallic hues. Some people like the simple classic style of black pens. Then there are people that like their pens an even darker shade of black, all black, simple and inconspicuous. For those in the latter, I have a pen for you to consider. 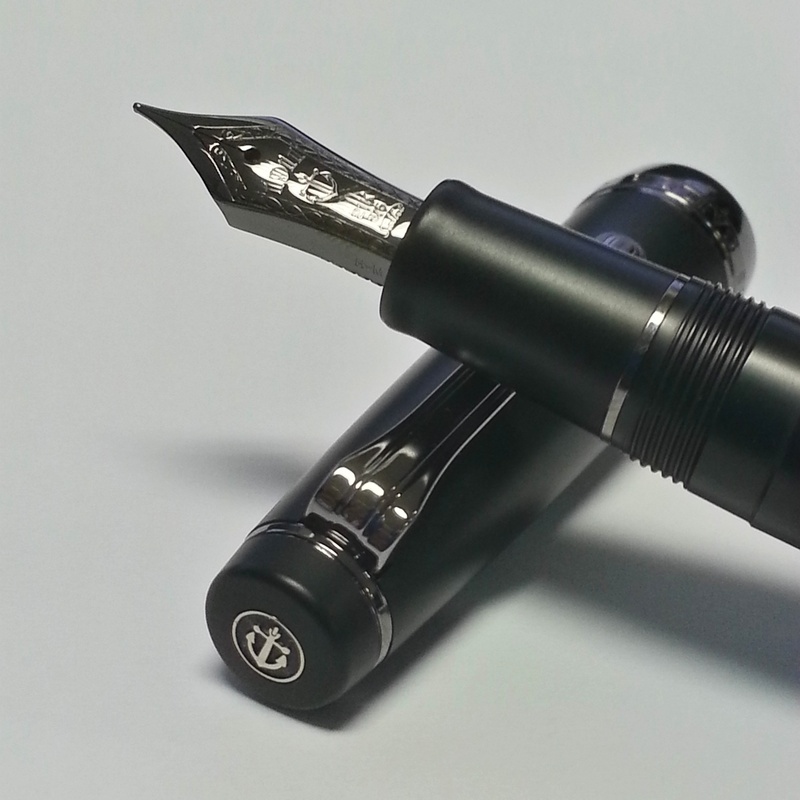 The Sailor Professional Gear Imperial Black. The pen body is a simple matte black, the trim is Titanium ion plated, and the nib is 21k also features Titanium ion plating. I certainly consider this one of the more attractive pens I own. This is my first Sailor pen. I decided on this model after seeing one at the Triangle Fountain Pen Show. I decided that I have enough brighter colored pens, and I wanted to add this matte black beauty to my collection. 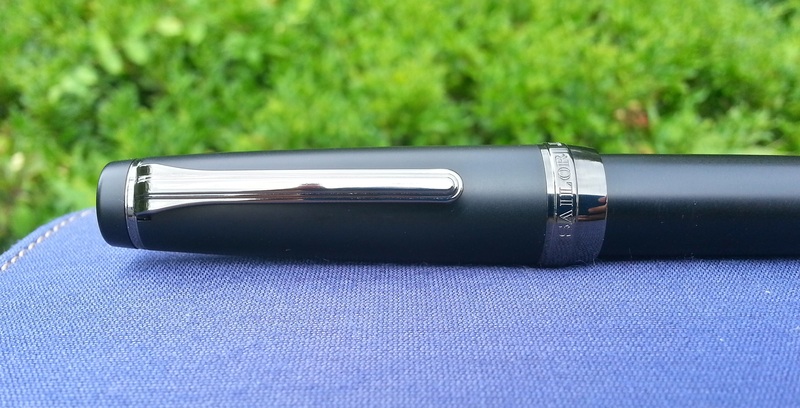 As Sailor has mentioned, the pen has a dignified professional appearance. After looking at a few reviews online I decided to purchase one. With a little more searching, I found one from a Japanese retailer at a reasonable price. There was only one US dealer (out of 14) that had one available, and the price was more than I planned on spending, especially after my purchases at the pen show. (US prices were more than double the Japanese prices.) The pen was ordered with optional express shipping and was sent out the next day. Three days later the pen made it from Japan, through NYC customs, to Raleigh and into my hands. When the pen arrived it didn’t come with a converter, just two boring Sailor black cartridges. Regardless I popped one in the pen and gave it a try. It worked just fine, albeit a bit too boring. I quickly ordered some more Sailor ink and a Sailor converter. Except I couldn’t wait for the converter to arrive so I could try a different ink. I promptly cleaned out the black cartridge and filled it with Sailor Yama-Dori. Why not one of the 50+ other inks in my collection? Well, Sailor states that using any non-Sailor brand ink with the black nibs will void the warranty. I doubt non-Sailor inks would be any issue, but why risk it. 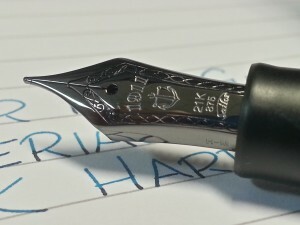 Plus Yama-Dori is a great looking ink; unique color and sheen. When I hear people talk about Sailor pens, the nib is usually what they mention. Prior to my purchase I had a chance to try the Sailor test pens which allow you to compare nibs. I noticed the Sailor nibs run slightly finer than comparably sized Japanese nibs from Pilot. After testing the different nib sizes, I decided the medium nib was the perfect all around size for my usage. The pen has what Sailor refers to as a hard medium (H – M) nib. Hard meaning the nib has little to no spring or flex to it. Even with the 21k nib, it is stiff. The nib while smooth does offer some noticeable feedback. I would say the feedback is similar to my Lamy Safari with black extra fine nib. Ink flow is neither dry nor wet, but has a balanced medium flow. When using Yama-Dori ink the pen will dry start if left uncapped for about five seconds. Nothing too out of the ordinary for a fountain pen. This pen is what I expected of it. Of course I did research the pen before I bought it. I knew the pro’s and con’s and saw the complaints about it. Many of the complaints were based on differing expectations of the pen and comparisons to dissimilar pens. The MSRP on this pen is certainly on the high side, higher than I can recommend. If you’re thinking of getting one make sure to check around. Regardless this pen will be a long-term part of my collection and is already in my daily rotation. EDIT: I loved having this pen in my collection. With all the other pens it didn’t get enough usage. It was sold to make way for another Sailor, the Sailor Pro Gear Slim. Coffee shops should have a separate line for coffee drinkers, the non-specialty drinks. Can I have a coke? Is Pepsi ok? Said NO server ever.